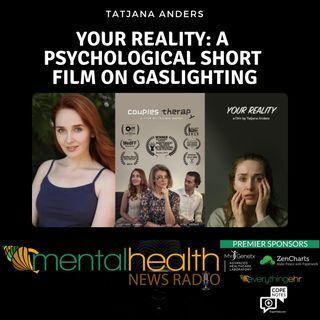 Join Tatjana and Vlad as they discuss Your Reality Film which is short about gaslighting. Gaslighting is a very dangerous type of psychological manipulation, because it makes you doubt your own perception of reality. In long-term relationships it makes you lose the confidence in yourself, rendering you pathologically dependant on the person who is closest to you at that time - which usually happens to be your gaslighter. Tatjana Anders is an actress and filmmaker. Your Reality is the second ... See More short film that she is writing, producing and acting in. Her first short film "Couples Therapy" has received 1 award and 6 official festival selections so far. She is making “Your Reality”, because a few of her friends have been gaslighted in the past and she's seen first hand how emotionally destructive it can be and how difficult it is to move on, once your trust in people has been broken. Vlad Paul Ghilas, Associate Producer, is a Digital Film Production student at Ravensbourne University London, who has an exceptionally good understanding of a film set with experience and links in various departments. Every filmmaker needs someone who is passionate about their craft, confident in their own ability, hardworking, creative and trustworthy. Luckily for us, in Vlad we find all those things and more.